All Aspire products, including plugs and cables, are made to the highest of standards, specifically manufactured to adhere to required regulations and guarantee customer satisfaction. Did you know, for example, that the Aspire UK Plug was the first to be fully CE Certified in the Vape industry? Every Aspire charger is made with the utmost care & attention, with customer safety at the forefront. Our Aspire e-cig chargers are compatible with most vape devices, not just Aspire brands. We supply many options to support the safe charging of a range of devices. Who wants to be restricted by how and where they can charge their Aspiree-cig? Our Aspire USB charger range allows you to charge your e-cig anywhere you wish! “Adaptable” is the best way to describe our Aspire battery charger selection. Charge with a laptop USB port whilst on a long train journey. Attach your official Aspire USB plug when you find a spare plug at work. The possibilities are endless. USB cables that are designed with adequate length and USB compatibilities. Lights on USB cables to indicate charging and 'charge complete'. CE Certified Plug adapters with a traditional look. Adapters are made to plug directly into your wall socket and charge your e-cig quicker than any other method. Aside from simply charging your e-cig, your Aspire e-cig charger will also let you know when charging is complete! A red light will be displayed when the device is still taking a charge, and a green light will be displayed when it is fully charged and ready to use. The cable will also pulse charge your device for that extra level of safety, helping to avoid overheating and potential hazards. Products in our Aspire USB charger range are manufactured to the highest standard. However, like most electrical goods, guidelines should be followed to avoid potential hazards that can occur when charging battery cells. Do not overcharge your e-cig – disconnect the charger as soon as the Aspire e-cig is fully charged, and the green light is displayed. Never leave any electrical device to charge unattended – if you are present, you are more likely to prevent a hazard in the unlikely event one occurs. Do not charge your e-cig overnight – this can potentially lead to a fire hazard and will effect longterm battery performance. Do not charge an Aspire e-cig battery with an unofficial charger, as this can casue damage to your Aspire e-cigarette. Always check the compatibility of your device and charger. Just because it fits in the port does not make it compatible. For further information on our Aspire charger range, please feel free to contact us today by calling 0333 577 5002 (local rates apply) or email admin@officialaspire.co.uk. 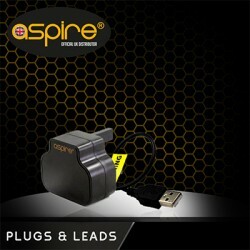 Aspire USB Charging Cable Official Aspire USB Charger lead comes in either 500mAh or 1000mAh T.. Aspire UK Plug Adapter Aspire New design A/C wall charging USB plug adapter. Fully CE Certifie..